With the cold weather the South has been having, coupled with the fact that Jake and I are seriously stretched with our budget right now, we made two dishes recently that both were economical as well as comforting. The first thing we made was chili. My dad's chili is amazing and I never thought I could even begin to make chili like him. This chili mix came first. About a year ago, Rachael and I went to this expo at the Agri Center here in Memphis and bought a whole bunch of soup, dip, and casserole mixes. I blogged about these mixes way back when my blog was a baby here when I made the Cheesy Chicken Enchilada soup mix. The company is called All of Us out of Louisiana. All we had to do was take the soup mix (which was basically a ton of spices), add tomatoes (we chose two cans of "Chili Fixins" Rotel tomatoes), kidney beans, ground beef, and water and cooked it on low for an hour or so. It made a TON of chili (the package says 14 cups) and we'll be eating on it for some time. 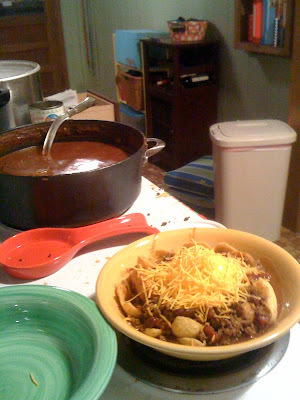 Last night we ate the chili "Petro" style with fritos, cheese, and sour cream. We're thinking about eating it with macaroni to have Chili Mac soon as well. The other comfort food we made was pizza. I can always eat pizza. We try to change it up a bit each time and the one we made tonight was the best I've had in a while. A few months ago we bought a small jar of pesto. It was one of the best buys we've had in a while. We've used it for all sorts of things - Pesto Chicken, Pesto Pasta, Pesto Pizza. The pizza tonight was pretty simple, cheap, and easy but delicious. 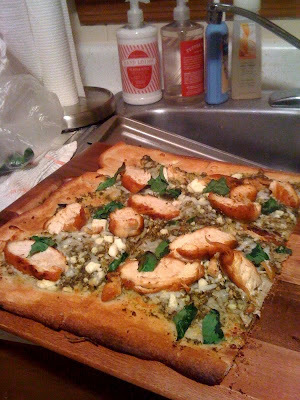 We used a Pillsbury crust and put pesto as the base, then mozzarella, feta, chicken, and spinach. It turned out well. That pizza looks delicious. I am going to try that - I have heard good things about the Pillsbury crust.